A Texas deputy sheriff was assaulted by what were described as two “undocumented” Mexican nationals following an attempted drug arrest. UPDATE — Jan. 15, 2 p.m.: The suspects have been identified by the Childress County Sheriff’s Office as Hugo Vargas, 25, and Mariana Mares, 21, Breitbart Texas learned in a phone interview with Red River Sun Editor Ginger Wilson on Sunday. The two undocumented Mexican nationals have living in Los Angeles. They both continue to be listed in critical condition at University Medical Center Hospital in Lubbock. Both have been charged with felony charges including: assault on a peace officer, attempting to take the officer’s weapon, evading arrest and detention, and possession of more than four ounces and less than five pounds of marijuana. Vargas faces additional charges of felony escape from custody for getting out of the handcuffs and fleeing the scene. Childress County Sheriff Mike Pigg told the Red River Sun that Deputy Ken Arant was attempting to arrest a man for allegedly having drugs in his vehicle. Childress is located in the Texas Panhandle region about 140 miles northeast of Lubbock. After cuffing the suspect, the man slipped from the handcuffs and began assaulting Deputy Arant, the Red River Sun reported on its Facebook page. The deputy subsequently tased the suspect. After being cuffed again and placed in the deputy’s vehicle, he was able to slip the cuffs again. The woman traveling with the suspect engaged in the scuffle and attempted to get the deputy’s gun. The two suspects were then able to get to their car and flee the area. During the high speed pursuit that followed, the driver lost control of the vehicle and rolled multiple times. The suspects were badly injured in the crash. The rollover crash occurred near the town of Estelline in neighboring Hall County. Deputies and EMS personell from Hall County responded to the crash scene and transported the suspects to a local hospital for their initial treatment. Both suspects were later identified as “undocumented Mexican nationals,” the sheriff confirmed to the local newspaper. The incident occurred shortly after midnight on Saturday. Breitbart Texas spoke with the Red River Sun Editor Ginger Wilson Saturday evening. She said Sheriff Pigg spoke with Deputy Arant who was resting at home following the incident. 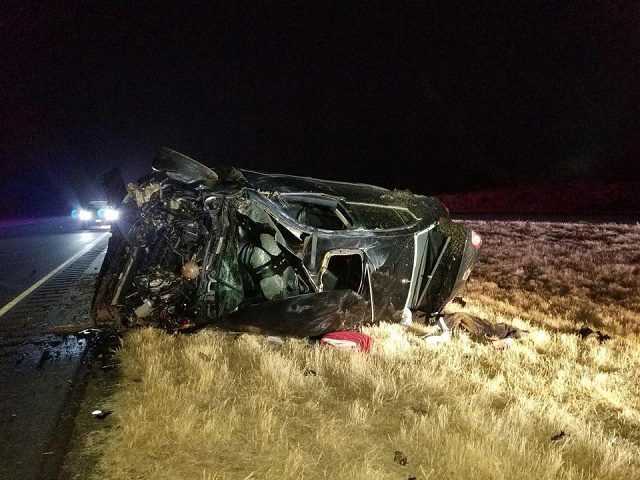 The sheriff said Arant was “sore, banged up, and bruised.” He expressed that the two undocumented Mexican nationals were lucky to be alive at all following the crash. Breitbart Texas Managing Director and Editor-in-Chief Brandon Darby contributed to this article.